Michelle Trachtenberg as Marina Oswald on the set of National Geographic Channel's KILLING KENNEDY, premiering this November. Following up on the first look photos of Rob Lowe and Ginnifer Goodwin as John F. Kennedy and Jacqueline Kennedy for the TV adaptation of Bill O'Reilly and Martin Dugard's Killing Kennedy comes our first look at Will Rothhaar and Michelle Trachtenberg for the film. Rothhaar is set to play former Marine and JFK's eventual assassin Lee harvey Oswald, while Trachtenberg, who can be seen holding a baby in the photo above, will play his wife Marina. 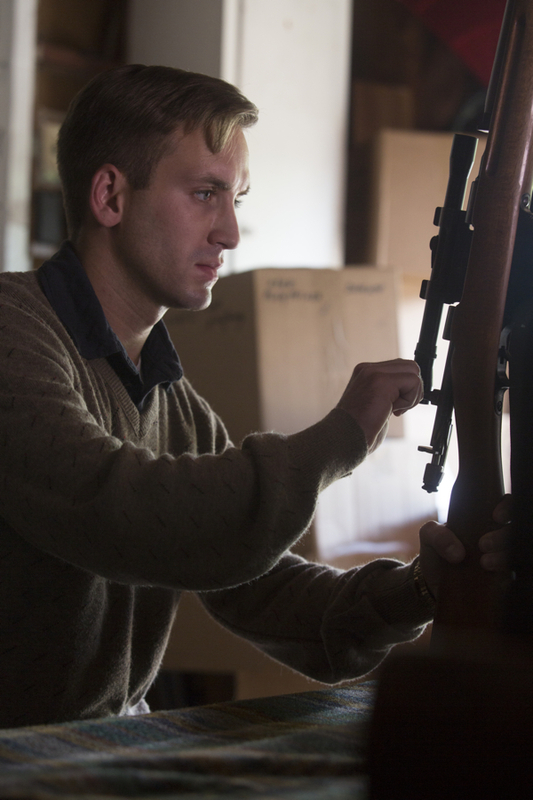 Will Rothhaar as Lee Harvey Oswald on the set of National Geographic Channel's KILLING KENNEDY, premiering this November. These two events start both men — one a member of one of the United States’ most wealthy and powerful families, the other a disillusioned former Marine and Marxist — on a cataclysmic track that would alter the course of history. Throughout we see their highs and lows, culminating in not one but two shocking deaths that stunned the nation. The TV movie is currently in production in Richmond, Virginia, and based on the photos we've seen, the costume and make-up look great. Michelle Trachtenberg, who's taking on her first Russian-speaking role for the part of Marina Oswald, is barely recognizable with her hair like that. And based on all four previously released photos, the hair seems to be a key factor in creating the look. For Rob Lowe, it's all in the bangs, while Ginnifer Goodwin's look speaks volume - absent "s" intentional there. Rounding out the supporting cast for the movie are Mary Pat Gleason, playing Oswald's mother, Marguerite. Francis Guinan plays Vice President Lyndon Baines Johnson. Boris McGiver is on board to play suspicious FBI agent John Fain. And Jack Noseworthy will play JFK's trusted brother and advisor Robert F. Kennedy. The name Jack Noseworthy conjures flashbacks of The Brady Bunch Movie and Bon Jovi's "Always" music video. So I'm particularly curious to see how he does as Robert Kennedy. We'll have to wait and see what other glimpses we get of the adaptation between now and the fall. Killing Kennedy is expected to air this November to coincide with the 50th anniversary of the assassination of President Kennedy.